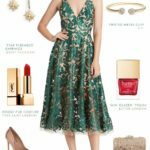 A festive holiday party outfit idea from head-to-toe style for formal and semi-formal parties and weddings during the holiday season! Affiliate links are used in the shopping links in this post, meaning this blog may receive a commission from our sponsors if a qualifying purchase is made. 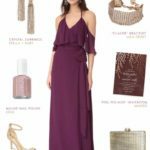 The start of the holiday party season is almost here, and it might be the time of year you’re planning your outfit for a special invitation! There are a ton of pretty looks this year, in all sorts of holiday colors and ornate fabrics. 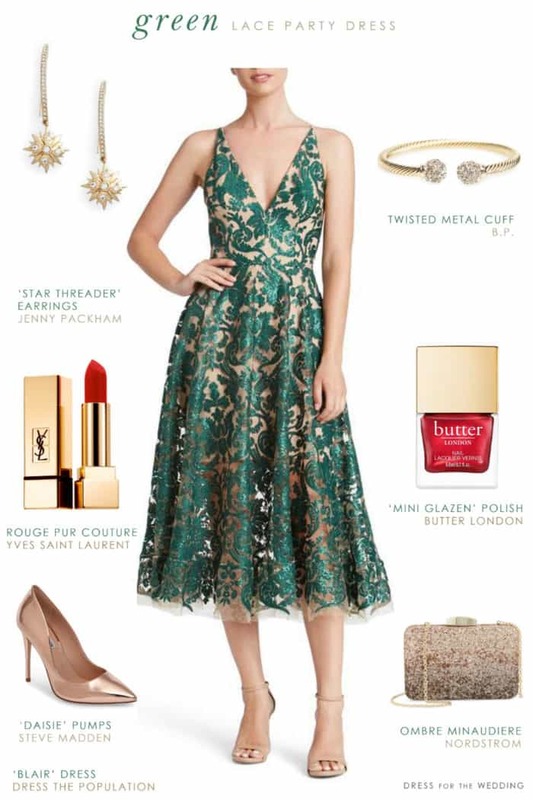 Today’s featured look focuses on this green lace party dress. 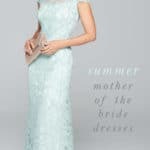 I loved in this dress, called the Blair Dress from Dress the Population in other colors throughout the fall season, and they just released this beautiful green lace over a neutral pattern. It has some subtle sequins and shimmer, and the contrast of the sheer fabric underneath makes the pretty lace pattern stand out even more! For accessories, I’ve added some gold sparkling pieces, and bright red nail polish and lipstick for contrast to the deep green color. To top it off, its a flattering midi length, and has a fun-to-dance in full skirt! 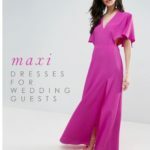 As always, this would also be a great dress to wear to a late fall or winter wedding, but I’m also hoping you have a fun party in the works to wear this to! 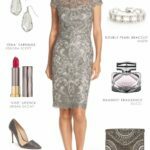 While I don’t miss working in a corporate environment, I do miss dressing up for holiday work parties, and this would certainly be a fun dress to wear! 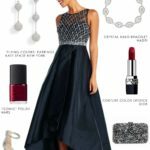 If you have several events, or are still considering what to wear to your next holiday event, I also have lots more ideas in the Holiday Dress Shop. 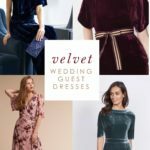 You may also like his post on velvet dresses also has some wonderful winter style picks! 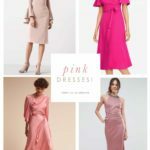 You can also check out my specific selections for winter wedding guest dresses or green dresses, or this outfit idea post for a December Wedding Guest.